We have furnished our Iridium Sat. Phone mod. 9505A with data kits. Using the Iridium Direct Internet 2.0.2 - Complete we have tested the PPP internet link that the software provides. The results have been disappointing. The link is very unstable and breaks after a couple of minutes. It takes quite some time to establish. This is despite the fact that satellite "density" is much higher in polar areas then in areas of lower latitude, due to the Iridium satellite orbit plane constellation. We must probably resort to software like MailASail that specifically addresses the problems that the unstable Iridium link represents. 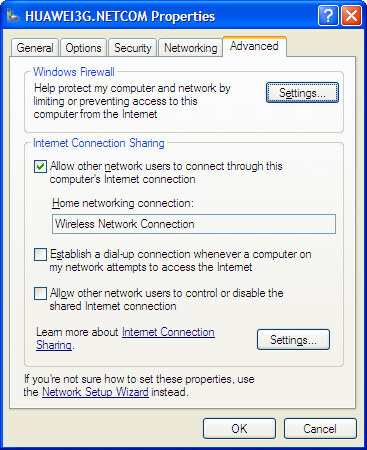 Let other computers on network connect to internet through laptop furnished with mobile broadband. 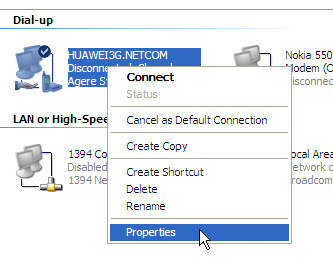 After getting Internet access on the PC where the USB Mobile Broadband device is connected, right-click this network icon, edit advanced network properties to allow internet access sharing through this computer. This computer will have two network interfaces: One for the mobile broadband, and one for the wireless lan (WLAN) adapter. 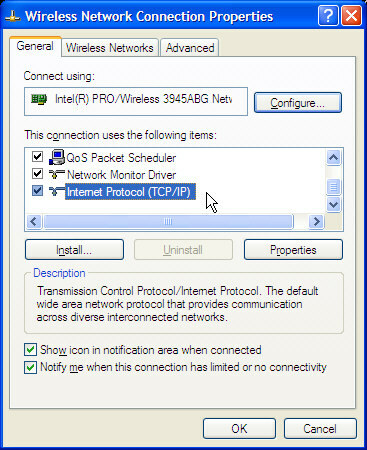 The WLAN IP-address can either be set automatically from the WLAN Access Point through DHCP, or statically by editing network adapter properties. Static IP-adresses will make internet shaing easier, so let's do this configuration. The following description applies to Win-XP machines; configuration on WIN7 should be similar. Click PROPERTIES, a small window appears, select the ADVANCED tab. Activate "ALLOW OTHER NETWORK USERS TO CONNECT THROUGH THIS COMPUTER'S INTERNET CONNECTION". Next step is to obtain information about DNS servers that is assigned to the mobile broadband connection. This information will later be entered into the other computer's DNS entries. DNS ensures you can adress other computers on the internet by ther name, not just their IP address. Open terminal window and execute the command ipconfig /all. 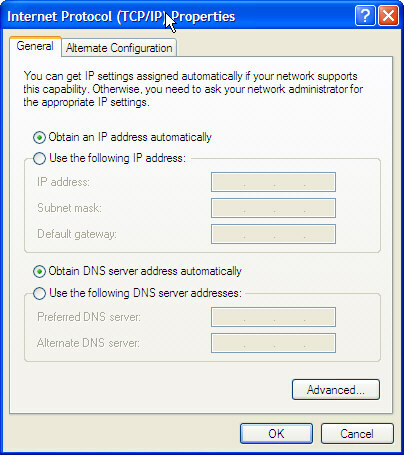 Obtaining DNS information using IPCONFIG /ALL command. In this example, the DNS server is 10.0.0.3. Make a note of the DNS IP-address - we will shortly need it when we configure the other computers. 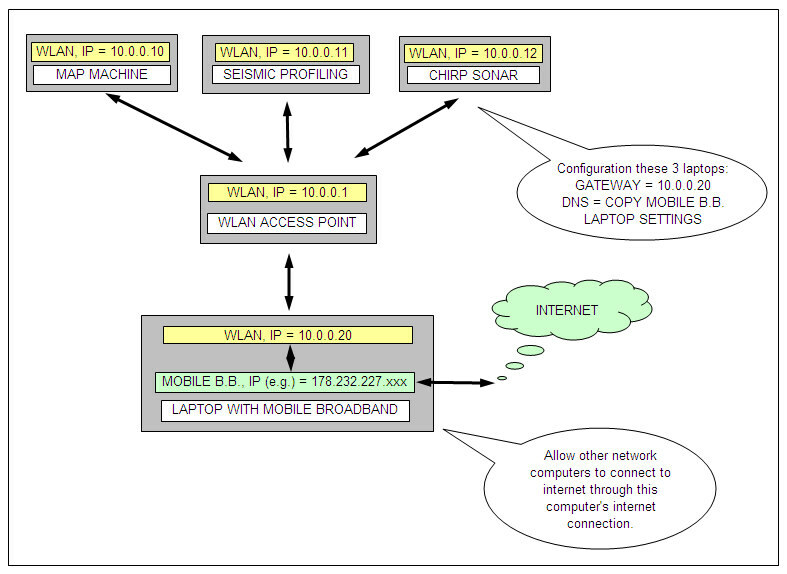 The WLAN Access Point used is configured to provide IP addresses via DHCP, starting from IP = 10.0.0.100. When a computer is initially connected to this Access Point, it will receive an IP address in the range from 10.0.0.100 to 10.0.0.254. We will instead assign static IP-adresses to all computers. This machine will act as Gateway to the internet. We will assign a static IP addresss of 10.0.20 to it's WLAN interface. and identify the icon that belongs to the WLAN. In this case it's configured for DHCP-usage. You can leave the other fields blank. Click OK.
Right-click this icon, select PROPERTIES, scroll down to INTERNET PROTOCOL, select it and click PROPERTIES. If you manage to ping a machine on the internet like this, you're in business!! Follow same procedure as in section above - only use a different IP address. Using two Linksys WRT54GL wireless access points furnished with high-gain directive antennas and new firmware by DD-WRT, we will try to establish a wireless bridge/repeater system between UNIS and the base area. The distance is about 3.5 km with direct line of sight. DD-WRT downloaded from this location. Use the Firmware update feature and first install Mini Generic, then the standard version. The setup follows instructions found here. Initial testing of such a system has been stable.